If you can hear a metallic rattle or buzz when you pick a note – sometimes all notes, sometimes certain notes or strings – it’s worth checking your bridge. The ABR style Tune-O-Matic bridge (the vintage style one) has six adjustable saddles held in place by a small retainer wire. As you can see in the photo, the wire runs across the top of all six saddle-adjustment screws and anchors in a tiny hole either end of the bridge. This is all very good and ‘vintage’ until it starts to rattle. If you’re having trouble tracking down a buzz, try damping the retainer wire in some way to determine if that’s the cause. Pop a bit of tape on temporarily or have a friend poke their finger on it while you play – whatever you need to see if the bridge is the issue. Once you determine you are actually afflicted by a buzzing bridge, all that’s necessary is to use a small, flat-head screwdriver to push down on the retaining wire between all six saddles. Doing this forces a slight kink into the wire which tightens the wire and forces it more snuggly against the saddle screws. I recommend going from one end to the other and kinking gradually rather than forcing large kinks in all in one go. It’s possible to force one or more too far and affect their ‘saddle holding’ ability so go slow. Take it easy and carefully. You should consider it a necessity to cut some thick card (a couple of thicknesses is best) to place on the guitar top, under the bridge. It’s incredibly easy to slip and stab your AAAAA-grade quilted maple top with a screwdriver blade. You don’t want that. Protect the guitar before you start jabbing screwdrivers at it. All going well, you should have a nice, silent retainer wire. Some wires require more persuasion than others to shut-up and it’s not uncommon to have to ‘re-kink’ from time to time after you do it as it works its way loose again. 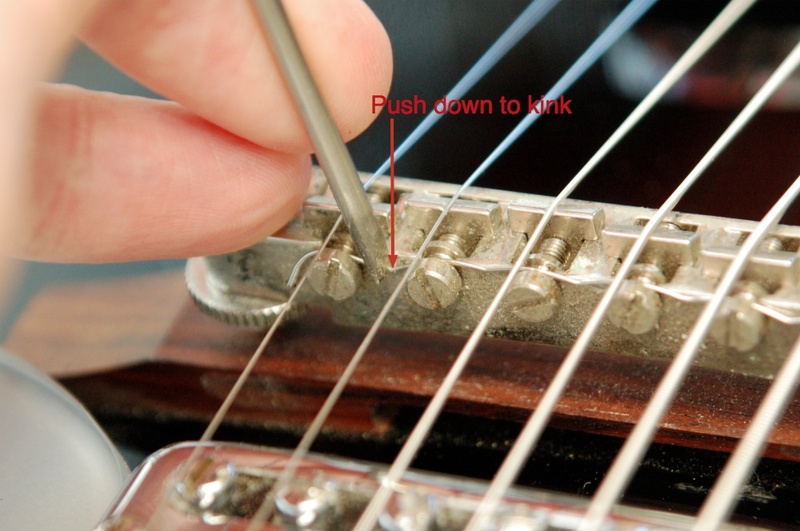 If you really mess up it’s possible to make a new retainer from a guitar string although it’s probably easier to just buy a new, ready-bent-to-shape wire. Easy-peasy. Just don’t get cocky and forget to protect the guitar top. As always, feel free to shout up with any questions in the comments and I’ll do my best.